Teens Michael Shaid and Silvi Specter were so inspired by JLI's Teens course at Chabad of the Main Line, PA, that they began to play an active leadership role in their community. At this year’s JLI Retreat two teenagers from JLI’s Teen program were honored for their leadership initiative. Michael Shaid and Silvi Specter were so inspired by the Teens course at Chabad of the Main Line, PA, that they began to play an active leadership role in their community. For many Jewish teens, bar or bat mitzvah is the end rather than the beginning of their Jewish education, yet it is a time when young people most need the guidance and wisdom that Torah provides. To meet this urgent need, three years ago, the Rohr Jewish Learning Institute (JLI) launched JLI Teens, a dynamic extracurricular program for Jewish High School students, designed to empower teens with a sense of purpose and direction through the study of Torah. The lessons which are interactive and vibrant, deal with real life issues such as belief in G-d, the value of life, the Torah’s view on suicide, abortion, love and relationships. Thanks to JLI Teens, thousands of Jewish teenagers in fifty cities on three continents are grappling with the meaning of moral life-and-death issues, mitzvah observance and much more. At this year’s JLI Retreat two teens were honored with the George Rohr JLI Teens Award for their leadership initiative. 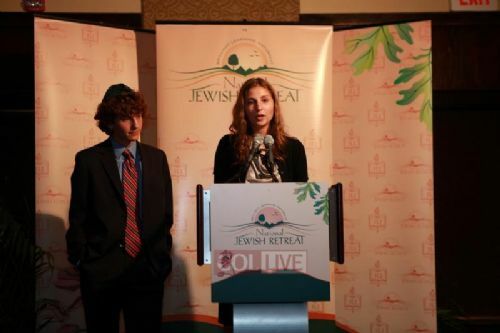 In this video, with humor and insight, Michael Shaid and Silvi Specter (grand-daughter of former senator Arlen Specter) share their story of how JLI Teens changed their lives.